"Let's go to Patagonia and climb in the winter!?" - my friend Carlos Buhler and I were looking for a June project and now I thought he had lost it! Having read countless stories about bad weather in the summer I could hardly imagine how miserable it would be in the winter. But in the end he convinced me that the weather would be more stable, albeit colder, in the winter and taking his word for it I bought an airline ticket to Buenos Aires. 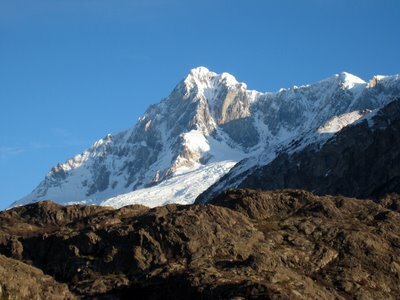 Cerro San Lorenzo seen from Puesto Muñoz with the East ridge (left) and North Face couloir (middle) clearly visible. 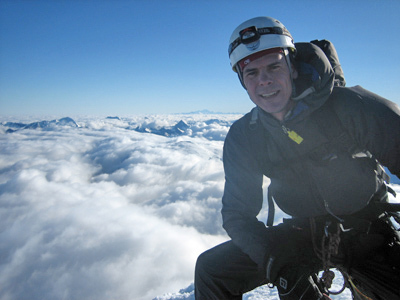 In addition we got pictures of the East faces from Doug Tompkins and Michael Kennedy (thanks!) 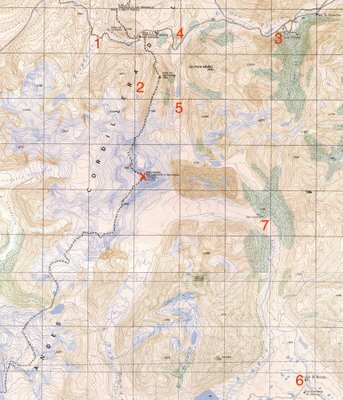 which together with the descriptions listed above convinced us that there was a huge potential for new mix routes on the Argentinean (East) side of the mountain. From the descriptions it was also clear that access to the mountain from the Argentinean side is not trivial. 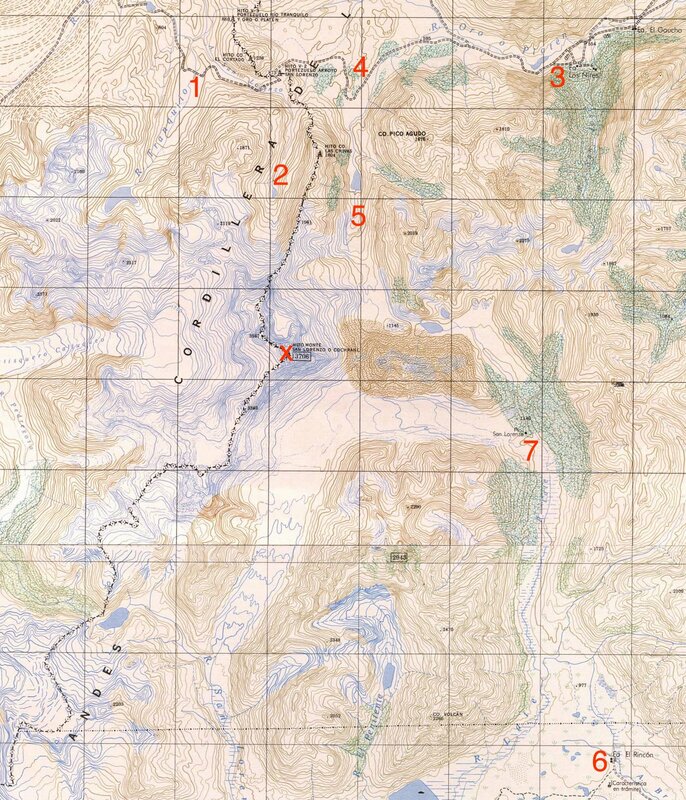 Basically, you can approach the mountain from the North-West (the normal access from Cochrane, Chile), the North-East (leaving Route 40 at Bajo Caracoles, Argentina and drive East to Lago Posadas via Route 39, then continue to Estancia Los Ñires and then follow Rio Oro to Puesto Muñoz), and the South-East (leaving Route 40 just North of Las Horquetas, Argentina and drive East to Parque Nacional Perito Moreno which you cross to enter Estancia El Rincón (owned by Doug Tompkins)). 1. The approach "road" from Cochrane. 2. The Agostini hut - base camp of the normal route. 5. Our ABC with hot springs. 7. 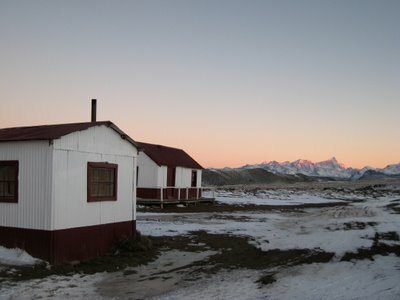 Puesto San Lorenzo (a basic hut owned by Doug Tompkins which has been used by previous climbing parties as shelter). x. Summit of Cerro San Lorenzo. Some of the descriptions had warned of difficulties getting permits from the land owners on the Argentinean side to access to the mountain and in addition it was clear that we would need a 4x4 to have any chance of getting within walking distance of the mountain. However, Doug Tompkins had given us permit to cross his land (Estancia El Rincón) and Sebastian Letemendia had put us in touch with Mario Sar (the owner of Estancia Los Ñires and Puesto Muñoz). We thus felt confident that we somehow would be able to get to the southern or northern East face from the Argentinean side. After a lot of research on price of 4x4 rentals and domestic airfares we decided to rent a 4x4 (Nissan X-terra2) in Buenos Aires and then drive the ~2500 km in each direction to the mountain! 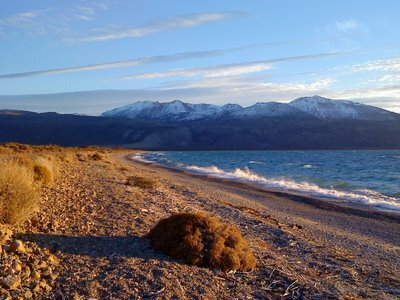 Renting 4x4's in Argentina is not cheap, but AbCars had the best deal we could find and they turned out to be trustworthy and efficient. 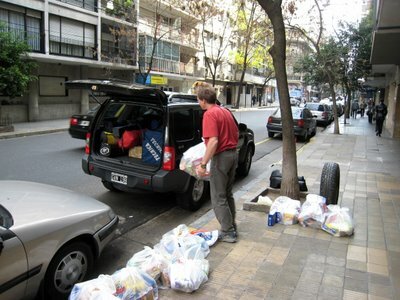 Based on recommendations from Tommy Heinrich we stocked up with 2 x 20 liter jerry cans, 2 spare tires and snow chains. Seemed a bit extreme and as it turned out we only needed one of the spare tires - but better safe than sorry (on average there was 200 km between gas stations in Patagonia). Also we purchased gas canisters and all our groceries in Buenos Aires as we were not sure what would be available down south. Carlos loading the 4x4 with gear and groceries. 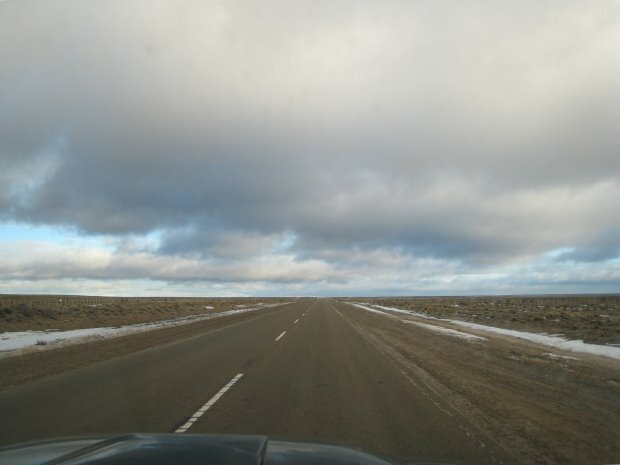 Most of the trip down south looked like this - straight roads on flat pampas. We drove down Route 3 which follows the Atlantic ocean all the way to Ushuaia in the extreme south. 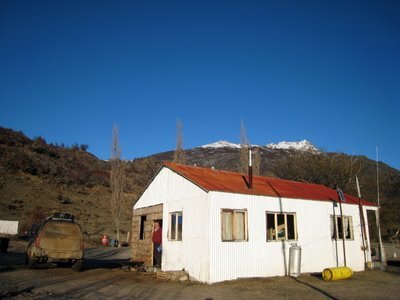 At Caleta Olivia we turned inland on Route 12 leading us to Route 43 which took us to the town Perito Moreno. 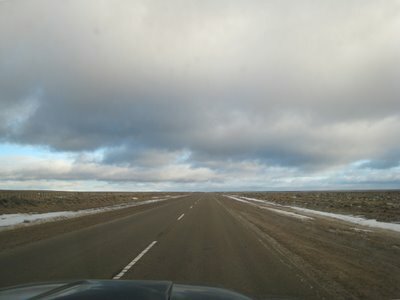 Driving on the pampas was pretty event less besides the occasional police controls (which except from the first one gave us no problems - it helped a lot to pretend not to speak Spanish!) and three road blocks by striking oil workers around Comodoro Rivadavia and Caleta Olivia. Luckily they only stopped cars for ~30 min so it was not too bad. Movie passing one of the road blocks. As we approached the Andes mountain chain, the scenery got much more beautiful and in Perito Moreno we turned south again on the legendary Route 40 (a partly gravel road, being paved now, following the Andes mountain chain throughout Argentina). Route 40 - which is partly a gravel road. We first tried the Southern access and after 3 1/2 days of driving we got to Estancia Menelik situated just outside the Parque Nacional Perito Moreno where we spent the night with the caretaker Manuel Pedro (thanks to the owners, Rafa & Augustin Smart, for given us permit to stay there!). Estancia Menelik with the South-East faces of Cerro San Lorenzo in the background. 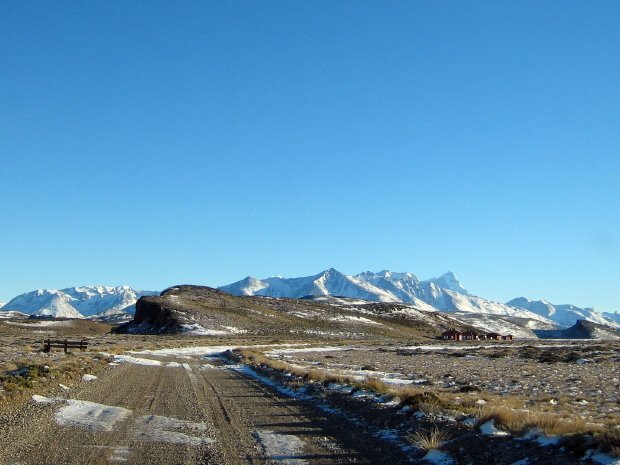 The entrance and park office (middle right) of Parque Nacional Perito Moreno with Cerro San Lorenzo in the background. Not liking the prospect of carrying all our gear and food 19 km just to get to Puesto San Lorenzo (from where there would be another ~7 km to the foot of the mountain), we decided to try the Northern access before we made a final decision on our approach. We thus drove back to Bajo Caracoles where we met Mario and Mari Sar - the owners of Estancia Los Ñires and Puesto Muñoz. In contrast to the 2006 AAJ description (which reported that the Sar's allegedly had charged 1200 US$ per person to cross their land) we found the family to be extremely friendly. Mario Sar thus guided our SUV all the way to Puesto Muñoz and let us stay in the new house they were building there for just 300 US$ total! 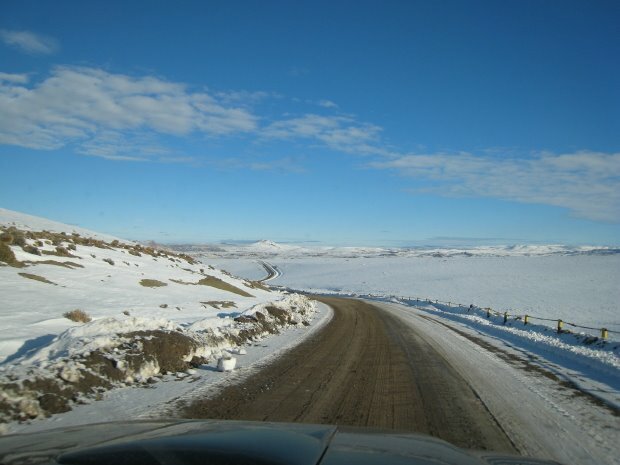 The gravel road (Route 39) to Lago Posadas was of high quality and the dirt road to Estancia Los Ñires was also pretty good (collectively 130 km from Route 40 to Los Nires). The spectacular natural dam between Lago Posadas and Lago Pueyrredón. However, the 15 km from Estancia Los Ñires to Puesto Muñoz was a mix of a rough track and a rocky river bed with several river crossings, which would have been impossible to navigate without a guide! As we got to Estancia Los Ñires in the dark we decided to spend the night there and then continue the next morning. Mario Sar enjoying the morning sun hitting Estancia Los Ñires. Video of one of the river crossings guided by Mario Sar. We were totally psyched when we got to Puesto Muñoz - it was close to the mountain and there was a new hut with a stove. The perfect base camp! Mario Sar's oldest son (also named Mario) had taken two horses from Estancia Los Ñires to Puesto Muñoz and after a nice beef lunch they rode back to Estancia Los Ñires. We were then left with his youngest son, Martin, and the gaucho Jose Luis, which were both great guys that we had a lot of fun with the following three weeks. 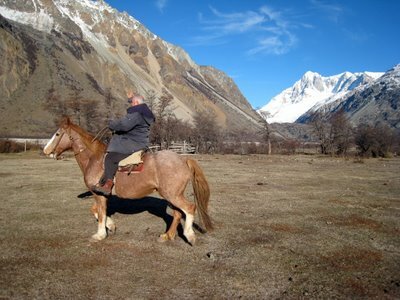 Mario Sar riding back to Estancia Los Ñires. The Rio Oro valley leading to Cerro San Lorenzo is seen in the background. Read the next part of the story: Cerro San Lorenzo part 2 - advanced base camp.